Troy and Tammy Wolbrink: Making a Difference in Madagascar! Making a Difference in Madagascar! 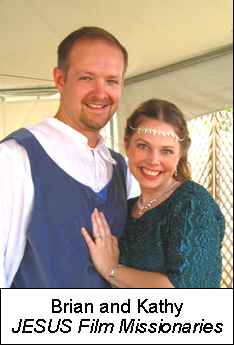 Brian and Kathy are missionaries who travel the world helping to translate the JESUS Film into other languages. They have an incredible impact in helping to spread the Gospel in many countries including Togo, Madagascar, Turkey and Senegal. Their work has literally opened doors for hundreds of thousands of people to hear a clear presentation of the Gospel in their own language. 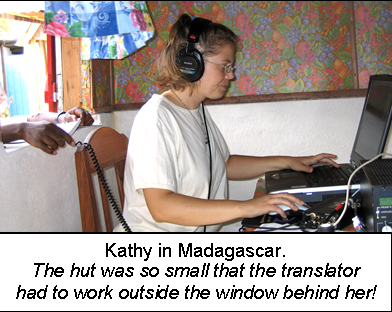 A few years ago, Kathy traveled to Madagascar to record the JESUS Film in the Sakalava Analalava language. At that time there were only a few believers among the Sakalava. Most practiced animism, the belief that spirits inhabit all objects such as rocks, trees, insects and mountains. The Sakalava lived in constant fear, worshiping these spirits to gain their favor and avoid their wrath. Kathy remembers vividly how one translator begged her to bring the Sakalava JESUS Film to her village. She said it was such a dark place but she knew that Jesus would make a difference! Another translator was cut off from his family for working on the film. And it did make a difference! A year later, 2,000 people watched the Sakalava JESUS Film in an open field. That night, 30 brave people committed their lives to Christ! Since then a woman who served demons for years prayed to receive Christ. Later, the Sakalava JESUS Film was shown on television. Along with 10,500 viewers, the Sakalava King watched the broadcast and accepted Christ! The King now plans to attend seminary and become a pastor! What could Brian and Kathy do with an extra day every month? A lot! They are among the 8,000 missionaries we serve through our software. Our goal is to help 10,000 missionaries save a whole day per month by reducing the amount of administrative time they must spend. Brian and Kathy wrote to us, “Thank you all for saving thousands of hours of work for us! It has empowered us to strengthen 10 times more of the body of Christ than before. The organization of our information frees us to focus on our ministry, without distractions of knowing the current ‘state of our flock’ (Prov 27:23) – quickly knowing whether or not we are fully supported or need to take time away from the field to seek more partners"
You might not know this, but you not only play an important role in our ministry, but through our ministry, you’re making a big difference with thousands of other missionaries. Thank you for giving to the Lord as you partner with us in your prayer and/or your finances!